The Oxford English Dictionary defines a pharmacopoeia as, ”A book containing a list of drugs, with directions for their preparation and identification; spec. such a book officially published by authority and revised at stated times”. It is used for standardisation and quality control in the preparation of pharmaceutical products. Frontispiece and title page of the first pharmacopoeia published in Sweden, known as The Stockholm Pharmacopoeia. 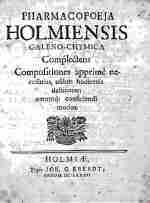 The Stockholm Pharmacopoeia, Pharmacopoeja Holmiensis Galeno-Chymica, from 1686 was the first pharmacopoeia in Sweden. It was compiled principally by doctor Johan Martin Ziervogel and was based on medical knowledge from other parts of Europe. Much was taken from German medical literature. In it you can find ways of treating ailments and many things which we no longer associate with medicine. What about medicines made of distilled human blood, pulverised cranium or parts of a mummified body? Also medicinal plants that are nowadays simply considered vegetables or fruits are included. The first Swedish national pharmacopoeia, Pharmacopoea Svecica, was published in 1775. By that time many “magical” items had been removed. Among the remaining medicinal plants were camomile, hops, buckbean and valerian. There are even some other plants, such as berries (e.g., cloudberries, wild strawberries, blackcurrants, bilberries and raspberries) and vegetables (e.g., carrots and parsnips). Ten editions, with various degrees of revision, were published over the following 175 years. The first seven were written in Latin, but at the beginning of the 20th century Swedish was the language used. After the 2nd World War, work on the pharmacopoeia was co-ordinated with the other Nordic countries and resulted in a common Nordic pharmacopoeia. At the end of the 1960s the first edition of a European pharmacopoeia was published – a co-operative production within the European Community, the EC. Sweden took part in this joint effort from 1976 and the Nordic pharmacopoeia was replaced by the European in 1978. Making an international pharmacopoeia takes time and demands a lot of compromises since each country is anxious to protect its own specialities within the pharmaceutical industry or raw material production. Such work also calls for the same criteria for quality and production to be used and for co-ordination between the laws of the various countries pertaining to pharmaceutical products. Backman, E L 1924. Om den äldsta svenska farmakopén, dess medicinskt-historiska bakgrund och dess ställning till folkmedicinen. Upsala Läkareförenings Förhandlingar 29:63-98. Grape, A 1946. Linné, Abraham Bäck och Pharmacopoea Svecica av år 1775. Svenska Linnésällskapets Årsskrift 29:1-34.